I confess on several occasions I thought it would be touch and go, especially on the night of my board meeting when I didn't get home until the middle of the night, and the last few posts have been like pulling teeth without tools or painkiller. Not because I am unable to pull the proverbial rabbit out of a hat (which teachers and principals are pretty good at, I think), but because the tiredness I felt several days ago turned into a 'thing' which pretty much wrote me off yesterday, leaving me laid out flat in bed. In order to answer this, we need to go back to post two, which was about using the GROWTH coaching model to set the goal for this challenge. 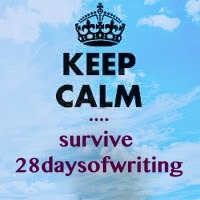 The goal was "By the end of 28 days, I have completed 28 days of writing for 28 minutes at a time, so that I can improve my writing skills, find my inspiration and become ingrained in the habit of regular writing." I feel I have completed the goal, and as a result of regularly writing I have indeed sharpened my skills. particularly around being less wishy washy regarding just getting on with it. I am unsure if this is a habit yet, but I do feel like my passion for writing has been reignited. It has been hard, but rewarding. 28 minutes is ridiculous for someone like me, and I confess (again) that sometimes it took me longer than the paltry 28 minutes allocated, to finish a post. I found that sometimes it wasn't practical to just sit and write for 28 minutes. In theory it sounded great, but the reality is that as a busy person, finding a quiet and uninterrupted place to write was nigh on impossible. My office very early in the morning or conversely very late at night would be ideal but I have to say, I would rather use that precious quiet time to complete the things I can not complete during 'staff and student' hours. So, sometimes, I had to leave a post mid formation, and come back to it later. Inspiration comes from many places and takes many different forms. For me, twitter has been marvellous in that the various educational chats I have either sat in as a passive participant or where I have been an active participant, have been real inspirations. When I see what people are contributing, teachers and leaders alike, I feel heartened. Signing up and making the commitment kept me on track, even on those days where I felt inclined to not participate, because I had told people I was doing it, I had a self imposed pressure on myself to follow through. I do wonder if what I am writing is of any use to anyone, including myself - after all, what I think is interesting in my head, does not mean that others will see it that way. I hope I have not bored anyone. Sometimes you need a bit of a thick skin. Someone misunderstanding your intent can be quite hard. Conversely, writing is meant to provoke and make a statement, so positive or negative, I guess it is all relative. I am quietly proud of myself for completing the challenge. I know how busy my world is right now and to have done this for myself is one of those personal achievements that makes me feel like I did something for me. I have met some pretty neat people on this journey and read some really good writing from others, which in turn, has been inspiring in its own way. Thank you, it has made it easier. Great question. I don't know. I would like to say that I will continue to post every day, and ideally, that would be marvellous but I suspect that the pressure I have placed on myself to post every day has not been helpful considering what I know is on my plate this particular term. I may however sign up in April. If there is one is April. I do know this, writing allows the muse in my head to get out and stop hounding me at night when I should be sleeping. Watch this space.